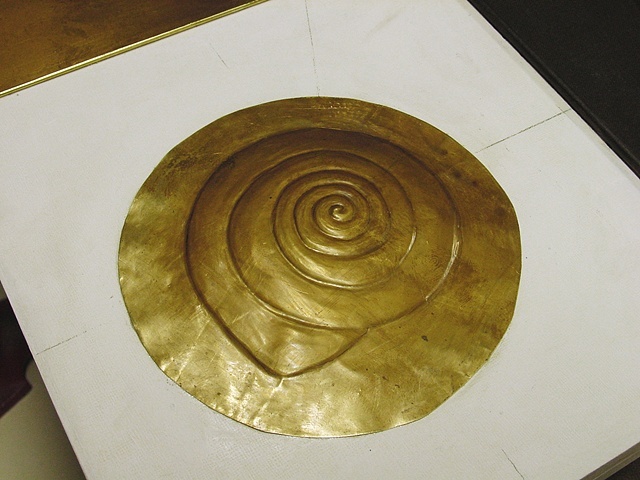 I traced an image of a snail onto a piece of brass. The size of the brass once trimmed will be about the diameter of the reliquary box. This process is called repousse, a process that creates a dimensional relief from a flat piece of metal. Once the design is traced onto the metal, working on a soft surface, you begin to rub the various sections of metal with wood or metal instruments to push the metal out. It is necessary to keep going from the back to the front where I would draw lines in the metal to define each area. I chose a snail because it shared spiral qualities similar to the tape measure, but being an organic entity, the growth spirals could not be exactly predicted. 18 1/4" sq. x 2"d.